So, it’s show time for the art world in London. Across the fairs and events visited thus far it seems there are trends for colourful work in bold primary and secondary colours and for textured work. These themes began to emerge at the Pavilion of Art & Design London, where works for sale particularly include a number of pieces by Agostino Bonalumi on Galerie Vedovi’s stand, which build geometric patterns by stretching the canvas over various obstacles, some slashed work by Lucio Fontana, several Antoni Tàpies relief paintings, and a collection of collages by Roy Lichtenstein plus a design for a contemporary tapestry. Here there seemed to be a particular choice of works with texture as the fair also contains a number of design stands, whilst the majority of work for sale is mid twentieth century. 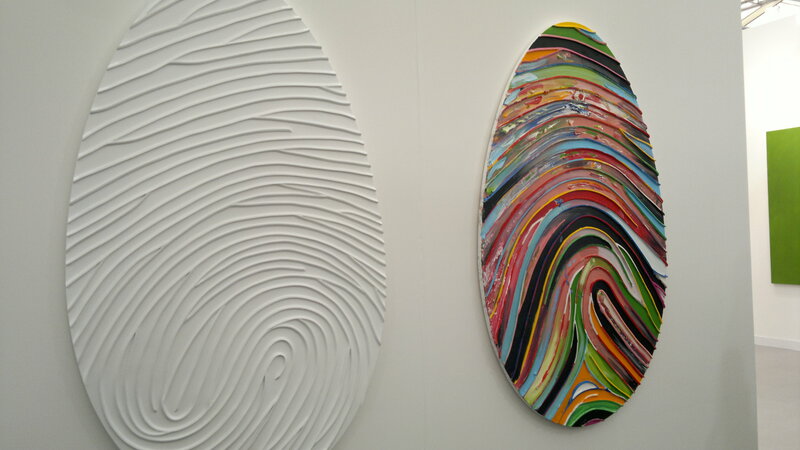 At the Frieze Art Fair, Marc Quinn has left his Fingerprints all over Galerie Thaddaeus Ropac’s stand. Indicating personal identity, authorship and uniqueness, the coloured version of this relief work seems to highlight the bacteria we may come in contact with in our daily lives, each secreting itself in a different groove in the texture of the finger print. Magali Reus’ Balance Sheet series on Galerie Fons Welters’ stand contrasts roughly textured silicon rubber with shiny, smooth aluminium grilles. Nick van Woert’s Not Yet Titled 7 (2011) on Yvon Lambert’s stand references Liam Gillick’s work and acts as a room divider almost akin to Richard Serra’s Titled Arc (1981), but is partially transparent. A series of equal blocks are stacked horizontally, each containing different textured materials in different bold colours, including liquids, loft insulation, wire wool, chippings and powder. 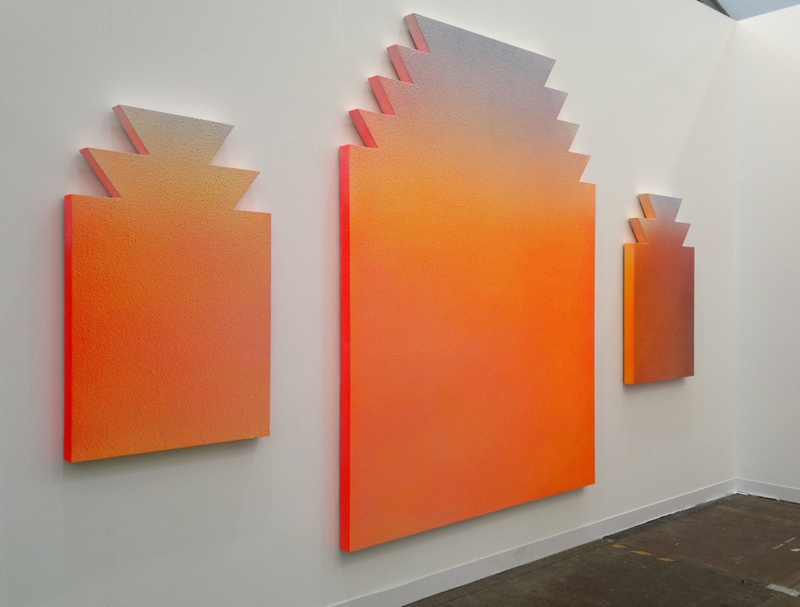 Further works at Frieze include a trio of paintings by Peter Peri on the Bortolami stand, Alex Israel’s Untitled (Flats) (2011) on the Peres Projects stand, and a work by Edith Dekyndt on Galerie Karin Guenther’s stand. 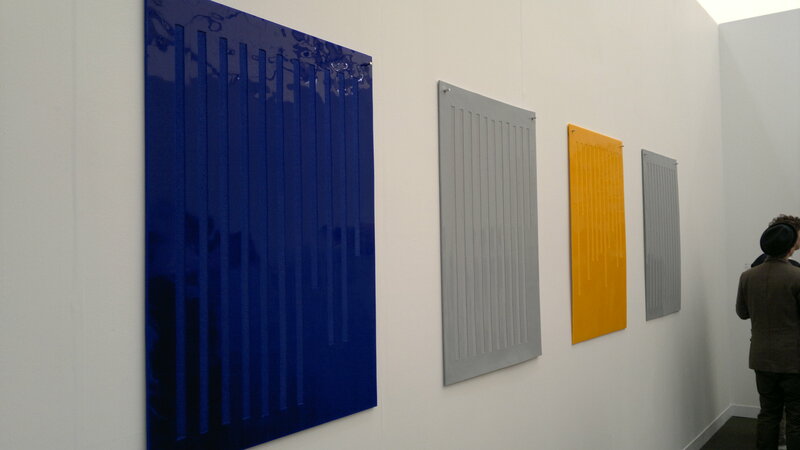 Peri’s works are reminiscent of Barnett Newman’s zip paintings, baring geometric vertical stripes in primarily blue and silver, with the later colour textured with what appears to be a considerable build up of paint runs to almost the texture of Artex, and Israel’s bare an even closer texture in their gradated orange surface. Meanwhile Dekyndt has presented a square or rectangular piece of green fleece or felt material, hanging from one corner, whilst she has painted (possibly with spray paint) the right half of the visible side black, leaving the green texture subtly coming through partially. Similar interests can be seen in the work of two Slade School of Art graduates short-listed for the New Sensations Prize for which an exhibition is on show in Bloomsbury. Julia Vogl produced a set of primary and secondary colour badges to indicate an individual’s role in the art world (artist, critic, collector, gallerist, etc. ), which perhaps everyone at Frieze should have to wear, and a similar set of coloured hand washes for you to wash away the relevant sin, presented in a set of transparent spherical dispensers. Meanwhile David Birkin presents a series of thirty 10×8” Kodak transparencies on a set of x-ray viewers. At what would be the top of each if they were hung landscape is printed a filename which relates each transparency to a casualty in Iraq. He has translated the code number assigned to the dead into the RGB coding of a colour shade, which fills the transparency. All those chosen for inclusion in the work are shades of red and pink, drawing us back to reflect upon a bloody conflict and the price paid by these individuals, and the medical procedures, many requiring x-rays, that are carried out on the wounded. Pavilion of Art & Design London is in Berkley Square, London W1 until 16th October 2011. 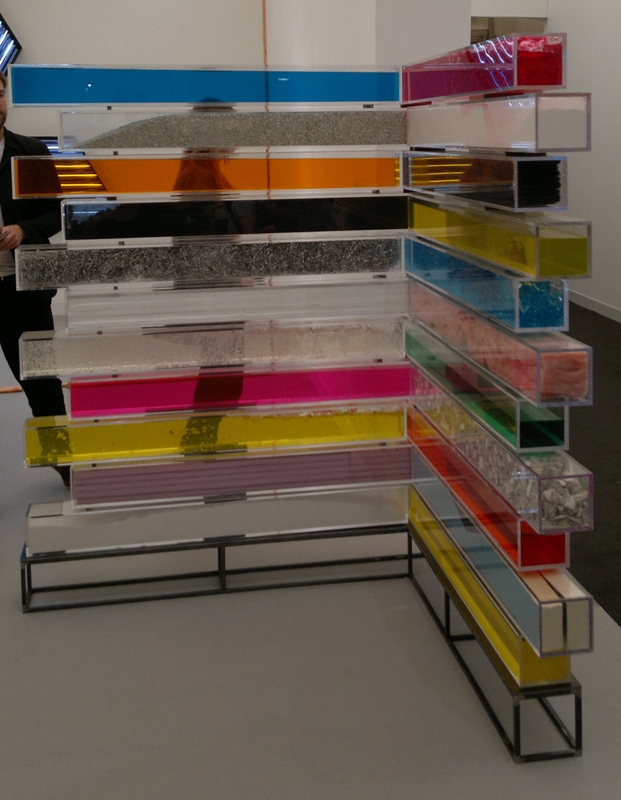 Frieze Art Fair is in Regent’s Park, London until 16th October. New Sensations Prize and The Future Can Wait exhibitions are at B1, Victoria House, Bloomsbury Square, London WC1 until 17th October. ← When Does Minimalism Become Too Minimal?